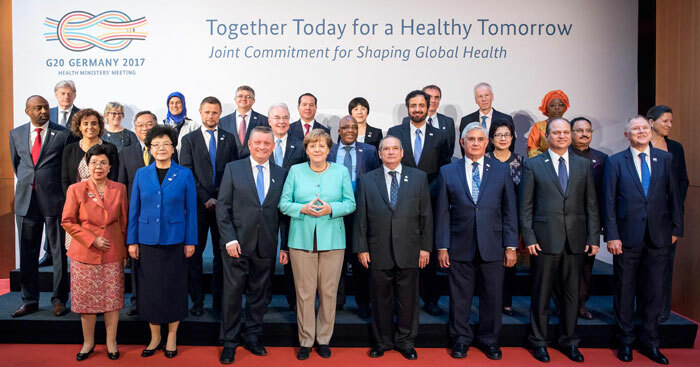 At the invitation of Germany’s Federal Minister of Health Hermann Gröhe, held under the auspices of Chancellor Dr. Angela Merkel, the first meeting of Health Ministers of the Group of Twenty leading industrialized and emerging economies (G20) took place in Berlin between 19-20 May 2017. Under the banner of Together Today for a Healthy Tomorrow, the two-day meeting focused on combating global health hazards. In their closing communiqué the Berlin Declaration the G20 Health Ministers recognize the importance of GISAID in regard to data sharing. "In regard to sample and data sharing, we recognize the importance of the WHO Global Influenza Surveillance and Response System (GISRS) and Pandemic Influenza Preparedness (PIP) framework, as well as the Global Initiative on Sharing All Influenza Data (GISAID)"
“The fact that global health is about to become a constant on the G20 agenda is a strong signal we are sending from Berlin today. After all, the well-being of all people – and that goes for industrialized, emerging and developing countries alike – depends on whether or not we manage to effectively address global health challenges. Just like every fire brigade holds regular exercises to prepare for a fire, we too will put regular exercises in place to prepare for health crises. Indeed, now we must make good use of the time to optimize our preparedness. By the end of 2018, the G20 countries committed to lead by example to combat Antimicrobial Resistance by developing and implementing national action plans based on a One-Health approach. We highlighted the importance of prescription and the need for intensifying research efforts, including a better coordination of existing initiatives. At the same time we noted the importance of supporting poorer countries and promoting access to affordable antimicrobials for all patients in need"